Helmet bascinet Hounskull ("Hundsgugel") is named of the conical shape of extended visor that resembles dog's muzzle. Helmet was popular among all classes of knights in the XIV-XV centuries. Bascinets had various shaped visors; however, Hounskull visor was probably one of the most widespread. 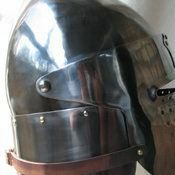 This model of functional medieval head protection is a part of well-known full-plate Churburg armor of the XIV century. There are numerous holes on the visor, so during the combat good ventilation and free breath are guaranteed. Mail aventail is attached to the vervelles, installed on the bottom edge of the dome. It protects throat, neck, shoulders and upper part of the chest. You may also like similar models of bascinets with Hounskull type of visor: Italian bascinet of the 1460 year, bascinet Hounskull with single ocular of the 1430 year, bascinet Hounskull of the early XV century. 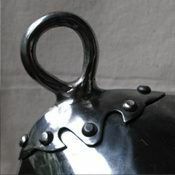 Chapel-de-Fer is a variation of medieval helmet of type Kettle hat (also known as Eisenhut, Kettle helm). This functional head protection was popular in XIII-XVI centuries among soldiers of all military branches because of simpleness of making. Despite of wide variety of models, chapel had one common feature – wide brims. Great visibility and ventilation, cheapness and ease of manufacturing, protection from the front and side hits and sunrays as well - these factors made chapel actual among infantry. 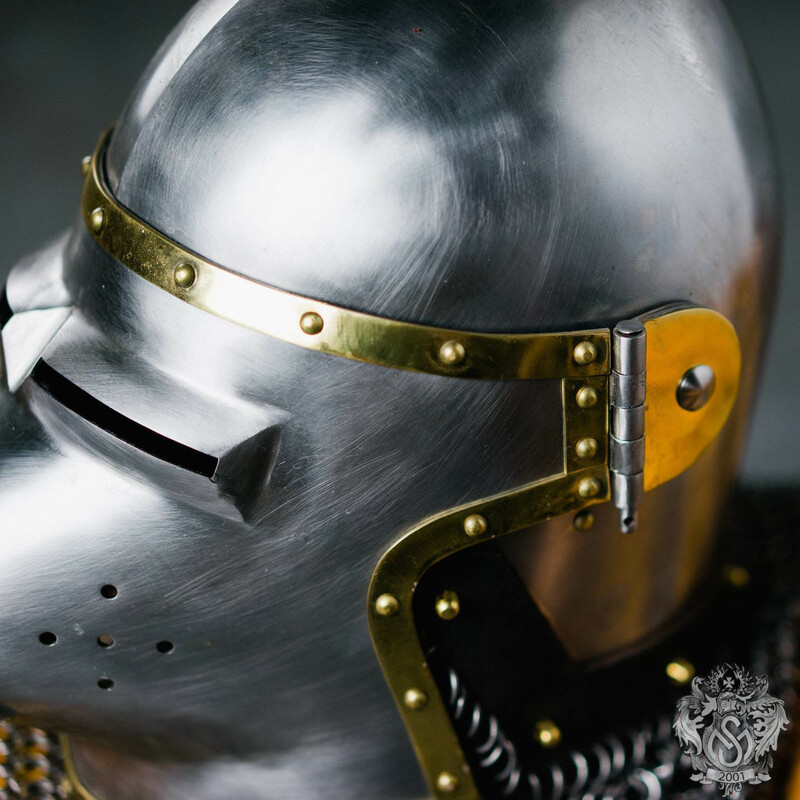 However, noble knights did not choose such type of head armor because of its simple design. 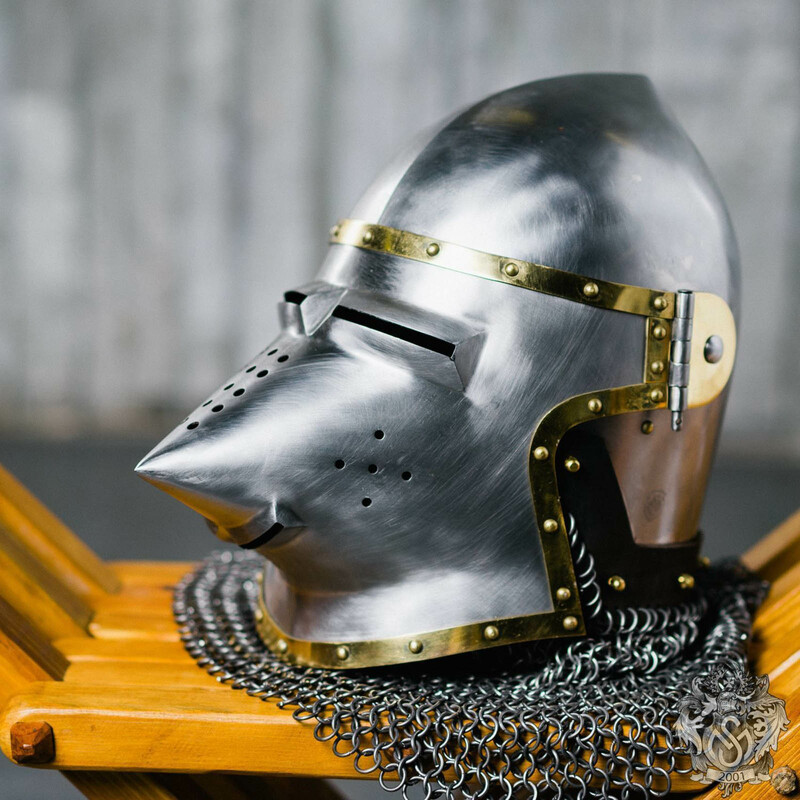 For more comfortable and reliable wearing of this medieval battle helm, we strictly recommend to wear it over padded or mail coif. Underchin leather belt with buckle fixes helmet on your head. You can use this functional handcrafted custom helmet for: SCA HEMA Larp Stage performances Medieval festivals Reenactment events Main photo shows early medieval helmet with following options: Cold-rolled steel 1.5 ..
Bascinet is one of the most popular helmet of the XIV-XV centuries due to its high protective qualities. These helms got various types of visor and dome shape. Medieval knights of all military branches were using bascinets. 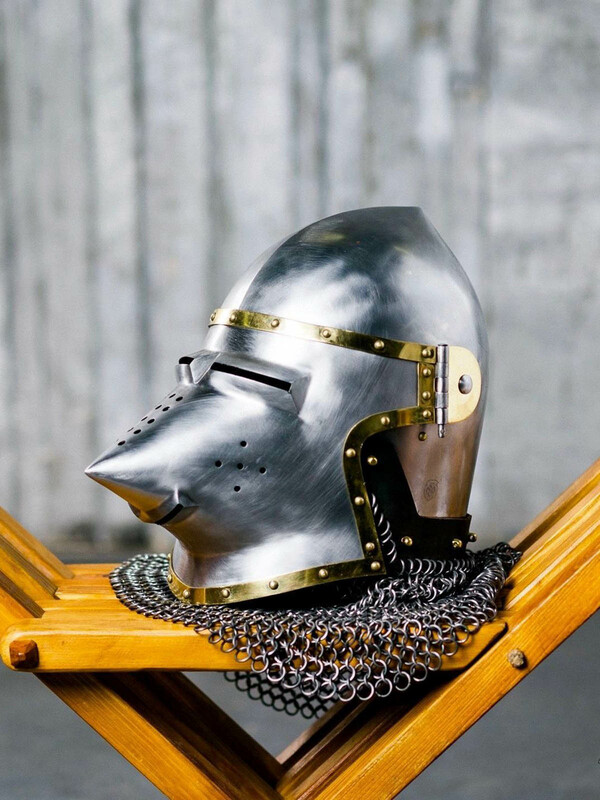 This functional head armor with bar grill visor is designed specially for SCA fights, bohurts, combats and medieval fencing. Distance between bars is 1.5-1.8 mm that is compliant to SCA-standards. 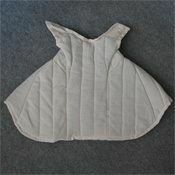 For better protection of neck, shoulders and upper part of chest, we recommend to complete bascinet with mail aventail. You can use this medieval style head armor for: SCA HEMA Larp Stage performances Medieval festivals Reenactment events Main photo shows helmet with lifting visor with following options: Cold-rolled steel 1.5 mm; Mirror polishing as finish treatment; Steel rivets; Steel nickel-plated buckles; Brown leather belts; Sewn liner; Visor back fixation with steel buckle Base price includes following options: Cold-rolled steel 1.5 mm; Satin polishing; ..
Conical helmet with full neck protection is a stylization of medieval head armor. 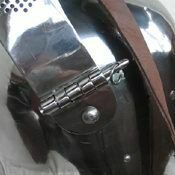 Battle helm is designed specially for SCA fights, combats, bohurts and medieval fencing. Shape of dome resembles Norman type conical helms. Non-movable visor has two eye slits and numerous holes for breathing. Solid back plate provides with neck protection. Functional helmet is fixed on the head with underchin leather belt and buckle. You can use this medieval style head armor for: SCA HEMA Larp Stage performances Medieval festivals Reenactment events Main photo shows closed helmet with following options: Cold-rolled steel 1.5 mm; Mirror polishing as finish treatment; Steel rivets; Sewn liner Base price includes following options: Cold-rolled steel 1.5 mm; Satin polishing; Brown leather belts; Steel nickel-plated buckles; Steel rivets; Sewn liner In options, you may choose another type and thickness of metal, color of belts, finish treatment and decoration. Benefits, which you’ll get..
German Gothic Sallet Here is an Italian, who immigrated to Germany and gained such a great popularity there, so people started to call him a German. That’s right, sallet has appeared in Italy back in the XIV century. 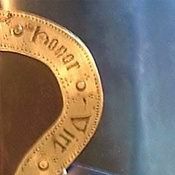 However, by the middle of the XV century it became a German helmet to the last rivet. It was an integral part of German full-plate Gothic armor and was all the rage until the early XVI century. Old faithful bascinet was an ancestor of sallet. Though, it gave life to the dozens of late models of helmets. Foes and haters often call sallet “a steel pot with lumiere”, but such simplification is appalling and deeply flawed. As sallet is quite complicated and interesting type of medieval helmet. It is easy to distinguish this good-looker from any other helmet. 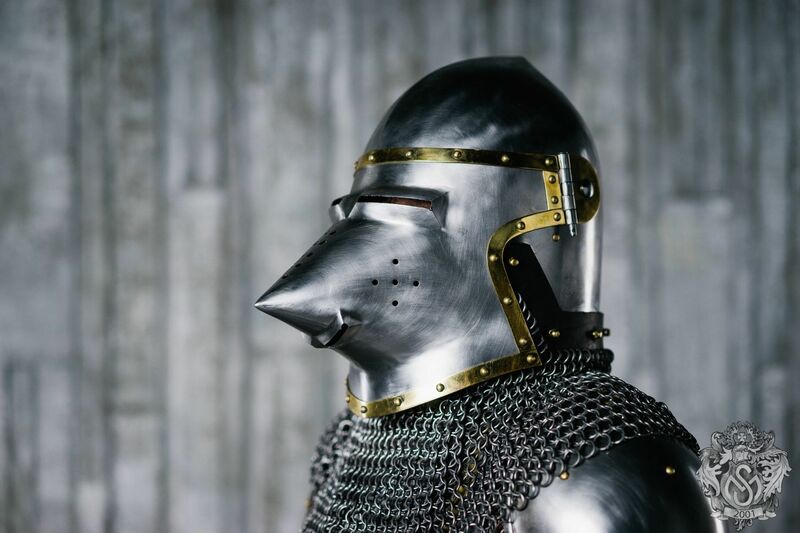 First of all, sallet always does have a neckguard – simple, but effective feature for back of neck protection. What’s interesting, the longer neckguard is, the more “German-type” your sallet is. Secondly, sallet always has “a comb” – lengthwise reinforcement rib,..
Padded medieval coif After a good bohurt, any fighter will say you that he is grateful at the most not to piece of iron in his hands, not to his armor and gambeson, not to greaves and bracers and even not to helmet (though, he is grateful to helmet very much). However, after a good bohurts, if a fighter is able to think straight, so he is mostly thankful to his soft, thick and good coif. Even though it did not glint in the sun as a helmet did, but it saved fighter’s head of cerebral concussion. If a fighting man was into luck to wear such big, soft and super-protective padded arming cap, made of the best natural linen, so he do not worry about head protection at all. As tailor of Steel Mastery have already worried about it by sewing, wadding and quilting a real medieval coif got him. You could see a fighter cracks a sly smile, as despite coif armor makes him look like a kind bear, he remembers that bears are dangerous beasts. 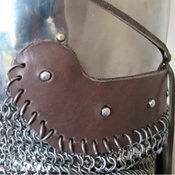 So, don’t delay: protect your head, neck and collar bones with padded arming coif and go ..
Incredibly beautiful and elegant plate gauntlets from Greenwich, Maximilian or Milanese full-plate armor are definitely good. One just want to shine up at tournament; it is not a shame to throw down such gauntlet before an Emperor, challenging him.  You may even wear rings on them… But, they are not very good for usual, hard training daily routine, when the pathos is not important, but easy wearing and reliable protection are. We don’t think that you are ready to wear expensive plate gauntlets and then bring them to blacksmith after every training or combat. 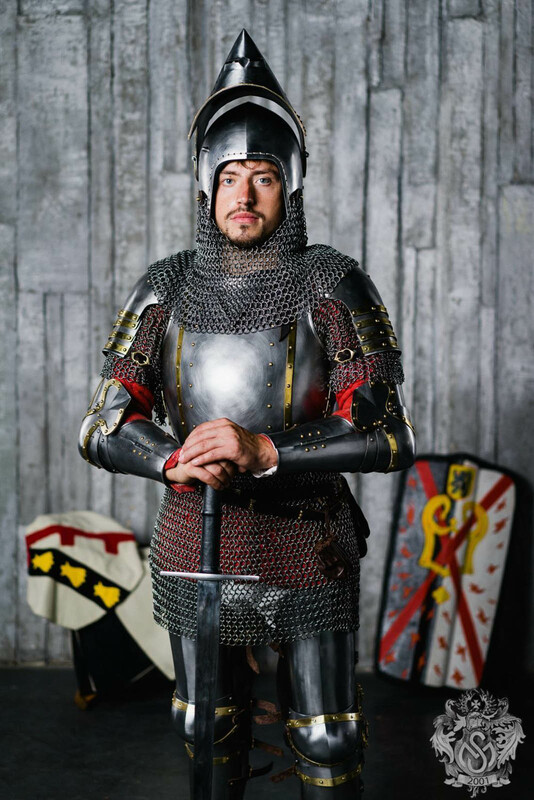 For such purposes, artisans of Steel Mastery hammered out this simple, robust and budget friendly real medieval armor – plate gloves for modern sword fencing. Wide metal plates allow good and firm hold of weapon without worrying about hands’ safety. Firm and soft croupon leather, belts with steel buckles, thick padded cotton mittens from the inside – that is how modern metal armor looks like. True fighters will not refuse to add this functional armor to their protective eq..